It is effortless to roll-out to your organization. Are you searching for a solution to kickstart Lean in your organisation? 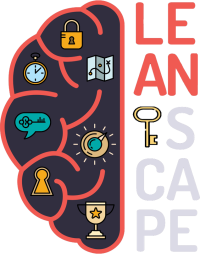 Leanscape is the easiest way to get everyone involved in agile ways of working while enhance teamwork at your company. It is the easiest and fastest way of becoming more agile. It's also more cost efficient than hiring a lean consult. It takes approximately 8 hours to finish Leanscape. Upon ordering, you will receive a licence that's valid for 12 months from the first log in. During this period, you can complete the training any time you wish, at your own pace. Three different methods are introduced (defined, statistical and empirical). development be used? And when shouldn't it? The principles and deployment of Kanban. How to increase employee commitment using Kanban? All of the topics include a theory section and many exercises such as simulation games, group exercises and thought provoking questions. The trainees reflect on the current practices of their organisation and come up with ideas to make concrete improvements in the future.